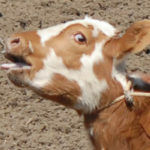 CALGARY—Animal Justice is calling on Calgary Humane Society (“CHS”) to prosecute inhumane rodeo practices at the Calgary Stampede. CHS is responsible for enforcing Alberta’s animal protection laws. Rodeo events as they are practiced at the Stampede rodeo inherently involve inflicting fear and pain onto animals. Each year many animals are predictably injured and killed during the course of these events. One animal has already been killed this year, on just the second day of the Stampede. Chuckwagon racing is so dangerous that more than 50 horses have been killed during this event at the Stampede since 1986. Calf-roping is so cruel that the tormented baby animals may cry out, suffocate, and defecate from fear and stress. Yet, not since 1950 has a Canadian rodeo or participant been prosecuted for animal cruelty. The Canadian Federation of Humane Societies—of which Calgary Humane Society is a member—states that it is opposed to rodeo and is working towards the ultimate abolition of this cruel activity. The CHS has also issued a policy stating its opposition to rodeo. Rodeo is so inherently inhumane that it has been banned in jurisdictions all over the world, including the City of Vancouver, the United Kingdom, and many American cities and states. To see the letter to the CHS, please click here.